Hunting is one of America’s favorite pastimes. Each year, Americans hunt a combined 282 million days, which equals out to an average of 21 days per hunter. If you’re thinking about breaking into this fine sport, you should know what you’re getting yourself into. Hunting isn’t for everybody — and that’s okay. If you do think you have what it takes, however, you should do plenty of research before your first time out so you are setting yourself up for success and not a terrible time. 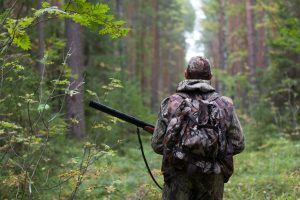 Here are some excellent tips for first-time hunters that will help you enjoy yourself this season. So many hunters get all gung-ho during their first time out and end up ruining the entire outing with their overzealousness. To be a successful hunter, you have to be patient. Spend a few hours just walking through the hunting ground moving extremely slow and listening for anything. A simple snapping of a twig is missed by the overzealous hunter, but if you’re quiet and patient, you’ll be able to identify what caused that sound and potentially get a shot. You’re never going to be a great hunter if you can’t shoot accurately. The only way to become a better shooter, besides shooting and missing hundreds of times out in the wilderness, is to visit a shooting range as often as possible. You can check out traditional shooting ranges and shooting at sporting clays to test your accuracy with a shotgun or you can improve your skills with a bow at an archery course. Whether you’re shooting at sporting clays, a stationary target, or wildlife, be extremely careful. The last thing you want to do is get lost during your first time out. Whether it’s your first time or your hundredth time, however, you have to pick distinctive objects that you’ll be able to easily recognize and gather your bearings. If you’re stalking an animal, you can very easily lose your place and your strategy if you don’t have any landmarks identified. If you want to become a great hunter, you’re going to have to do a lot more than these three tips — but it’s a good start. Practice shooting with sporting clays, learn to be patient, and study your hunting land. If you want to learn more, contact Woodfire today.